What would be in your perfect city? Urban gardens, green parks, convenient public transportation; museums and galleries, wacky skyscrapers, a plethora of markets and stores? What about if you were building the purr-fect city for cats? Flux Factory’s latest collaborative experiment is Kitty City, an urban planning and community engagement project for kids and kittens. Using materials from MFTA’s warehouse, an inter-generational team of artists, city planners, and kids join forces to design a thriving meowtopia for felines right here in Long Island City. The project encourages “shared decision-making power and challenges the way we think about the urban environment.” Focusing primarily on the creative planning process, the project is spread out over four workshops on Saturdays this May. Kids see the collaborative design process from beginning to end by conceptualizing, strategizing, and executing a plan together. Beginning with a visioning exercise at the first workshop, kids brainstormed all the urban elements that the kitty-zens of the city might want and need. Narrowing down the many ideas, they collectively decided on what components could feasibly and creatively be completed. After a mapping activity, kids started to design the city. They planned parks; water, transportation, and sanitation systems; residential, commercial, and cultural districts; and healthy food access. They drew where the kittens would play, eat, drink, and sleep and even plotted areas where there could be catnip gardens. At the following workshops, the team began to build. Kids were involved in all aspects of the construction process too. Working with artists, they learned how to safely use equipment to assemble urban structures. They also discovered how to repurpose materials into artistic ingredients for the city. Cardboard tubes were transformed into gates; boxes and storage crates became cat condos; old holiday decorations were transplanted as shrubbery. Giant mushrooms donated by Thomas Carroll Scenery were renovated into prime tabby townhouse real estate. A well-groomed city needs some flair, so after building, the team used ribbon, fabric, paper, paint, and other trim and scraps to decorate. The Flux Factory has partnered with For Animals, Inc to host a kitten adoption drive on June 1. Paws at the Flux Factory (39-31 29th St, Long Island City) this Saturday between 12 – 6 pm for Kitty City’s ribbon cutting ceremony and adoption drive. Adoptions are free-of-charge and new owners can leave with their furry friend on the same day. The Flux Factory supports and promotes emerging artists through exhibitions, commissions, residencies, and collaborations. 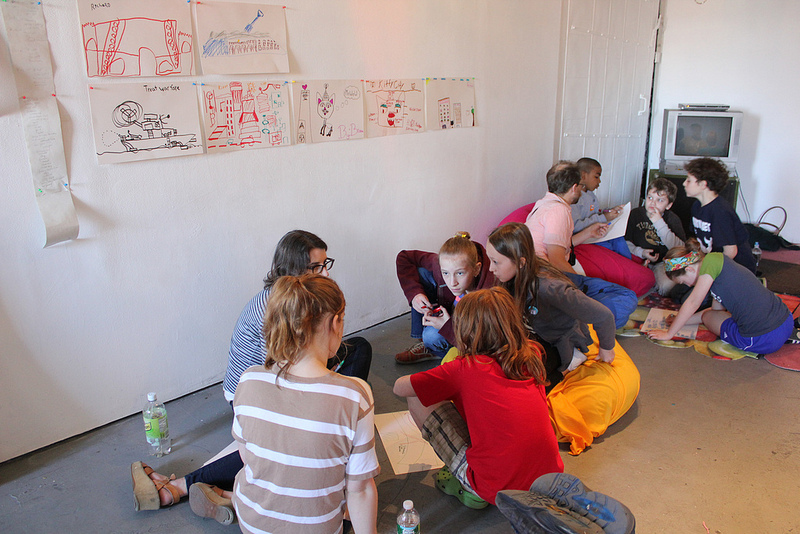 Nurturing the creative and collaborative process by providing a network of peers and resources, Flux Factory encourages participants to create innovative new works by working with new people, new organizations, and new media. The artist-run organization functions as a laboratory space for art creation that is in dialogue with New York City’s physical, social, and cultural spheres. Curator and writer Mille Højerslev Nielsen invites artists of all disciplines to participate in an exhibition that will explore themes related to the early carnival.